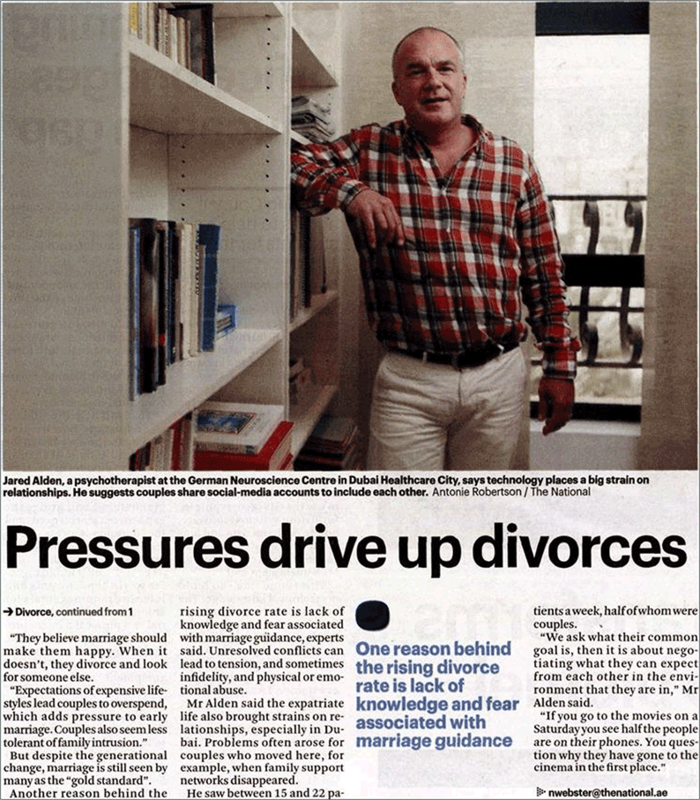 Social media, financial pressure and lack of communication have been blamed by counsellors for rising divorce rates. They say a change in young newlyweds’ expectations of married life is also contributing to a divorce rate that is said to be comparable to Europe but growing faster. 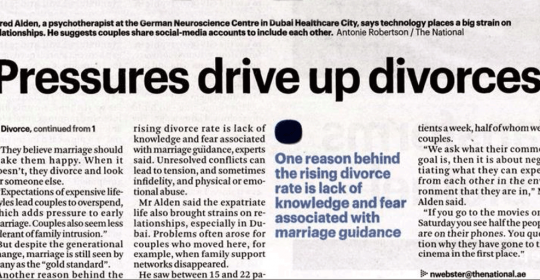 Jared Alden, a psychotherapist at the German Neuroscience Centre in Dubai Healthcare City, says technology places a big strain on relationships. “Social media figures very highly, easily in 85 per cent of the couples that I see,” Mr. Alden said. “Facebook is fine but it is the same as an email, where it is difficult to understand the tone and make the correct interpretation. Problems created by social media feature highly in people’s lives.” He said couples should consider sharing a social-media account to include each other. Divorce cases rose by 7 per cent between 2009 and 2011 for Emirati couples in Dubai, and in Ajman, official statistics showed the number of divorces increased 4 per cent – from 2,351 to 2,443 – from 2012 to 2013. Figures in Abu Dhabi, from the National Bureau of Statistics, have been stable since 2008, when there were as many as four divorces for every 10 marriages. But numbers dropped in 2011, with courts recording 15,105 marriages and 4,145 divorces. Dr Rider said there were many reasons for the higher divorce rate, including changing expectations of marriage. Once it was mainly a social and economic arrangement to cement ties between families and produce children. Now, happiness is considered crucial. “Young people are now exposed to other ways of thinking about marriage,” Dr Rider said. “They believe marriage should make them happy. When it doesn’t, they divorce and look for someone else. “Expectations of expensive lifestyles lead couples to overspend, which adds pressure to early marriage. Couples also seem less tolerant of family intrusion. But despite the generational change, marriage is still seen by many as the “gold standard”. Another reason behind the rising divorce rate is lack of knowledge and fear associated with marriage guidance, experts said. 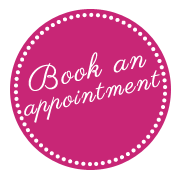 Unresolved conflicts can lead to tension, and sometimes infidelity, and physical or emotional abuse. Mr Alden said the expatriate life also brought strains on relationships, especially in Dubai. Problems often arose for couples who moved here, for example, when family support networks disappeared. He saw between 15 and 22 patients a week, half of whom were couples. “We ask what their common goal is, then it is about negotiating what they can expect from each other in the environment that they are in,” Mr Alden said.